Ogata Gekko (1859 - 1920) Illustrations of the Forty-seven Loyal Retainers (Gishi shijushichi zu): Tominomori Sukeemon Masanori, 1896. Deluxe Oban. Ogata Gekko was a fine international artist and truly an artist of the Meiji period, exhibiting in London, Paris and Chicago. He was influenced heavily by Hokusai and the tradition of Nihonga or Japanese Style Painting. Despite this he was one of the foremost war artists during the Sino-Japanese war and a fine draughtsman of contemporary events. With Ogata Gekko we see an almost complete migration away from the traditional forms, styles and methods of representation in ukiyo-e towards western (modern) style representation. By the end of the nineteenth century, Japan’s cultural isolation had well and truly come to an end and in the 1890’s artists produced these very exciting crossover works, where there is a creative tension - a push and pull - between the traditional and the western influence. This print is fully western in its understanding of dramatic perspective and yet, naggingly harks back to one of the enduring myths of traditional Japanese culture - the Forty-seven Loyal Retainers. In 1702 Lord Asano of Ako was provoked by Kira Kozukensuke into drawing his sword in the shogun's palace, for which he was forced to take his own life. Forty-seven of his retainers became Ronin - samurai without masters. They vowed revenge on their leader and attacked Kira's palace the following year, decapitating him and carrying his head to lay on Asano's grave. They in turn took their own lives. Kuniyoshi made the now very famous history of the 47 Ronin his own with the famous series Seishu gishi den, (The Faithful Samurai) in 1847. Perhaps the most popular and best known of Kuniyoshi's work, this series established the form that subsequent prints would assume, including the composition and detail of this very successful and popular series by Gekko. 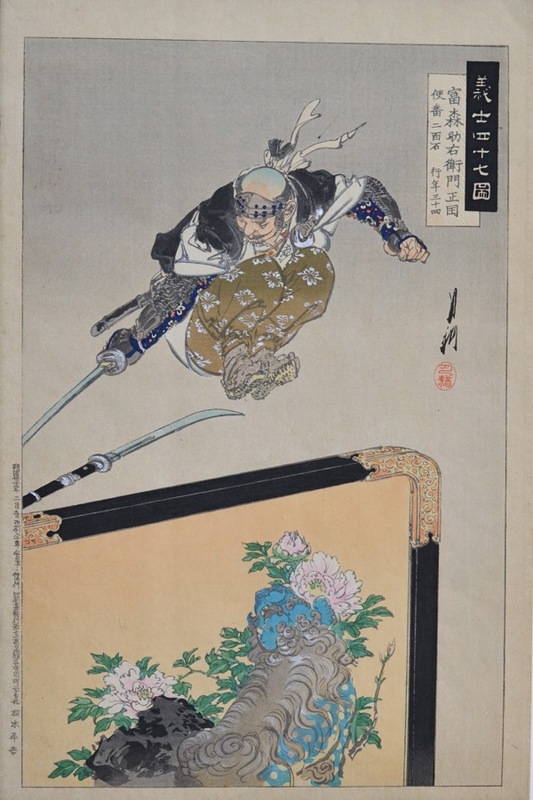 The late Meiji take on the story is rather different in that Gekko shows the Ronin actually in combat with real albeit unseen assailants; whereas Kuniyoshi has them battling quite unheroic plant stands and screens. This print is a fine example of Meiji printing at its very best. Sometimes it is hard to believe that these subtle prints are not made with hand applied water colour. The cartouche describes Masanori as tsukaiban rank, with 200 koku stipend and aged 34 at death. The bokashi shading and highlights of silver animate the leaping figure. Colour, impression and condition are all fine. Full size with margins. A copy of this print is in the British Museum.